Pioneers in the industry, we offer Everest EV235 1.5 Hp Dry Piston Vacuum Pump, Everest EV235T 1.5 Hp Dry Piston Vacuum Pump, Everest EV244 2.0 Hp Dry Piston Vacuum Pump, Everest EV244T 2.0 Hp Dry Piston Vacuum Pump, Everest EV255 5.0 Hp Dry Piston Vacuum Pump and Everest EV255T 5.0 Hp Dry Piston Vacuum Pump from India. Dry vacuum pump work on the principle of NO OIL/NO WATER and are the newest development in the pump industry. They have a number of advantages over the traditional pump designs which is used to be operational till date. Since there is “NO OIL/NO WATER” in contact with the process vapors, therefore they are considered extremely environmental friendly. Everest is No.1 in India for manufacturing pumps with over 1000’s of units installed across various industry segments. Capacities are available from 120 m /hr -3000 m /hr. Incase of Roots blowers or roots vacuum pump, rotary plunger pumps are used inside which two impellers move in opposite directions. 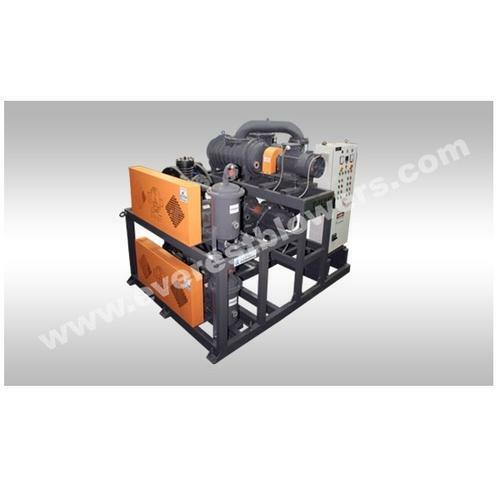 A root blowers has the capacity of attaining high pressures of up to 10-5 millibars making it perfect for applications where large volume outputs and improved displacements are necessary. Everest Blowers is offering the whole range of vacuum pumps that offer optimum flexibility and maximum process for fast evacuation. These root pumps are perfect for high vacuum applications and can handle pressure up to 10-5 millibars. These are widely used in the industries where large volume outputs and improved displacements are necessary.